Koat Pitha, also known as Banana Pitha, is a delicious Assam recipe. It is prepared with banana, rice and jaggery. It is very yummy to eat. The ingredients to serve for four are mentioned below. Arrange them and cook according to the cooking instructions given. 1 Take six pieces of ripe mashed Bananas and mix it with Jaggery. 2 Fold Rice all all purpose flour slowly into the mixture of Banana Jaggery. 3 Next heat the Oil and then spoon the batter in the hot Oil keeping it on a medium heat. 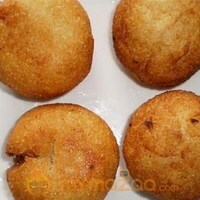 4 When the pithas have turn golden brown drain them on brown paper. 5 This sweet dish is ready to serve.